This article uses publicly available evidence from 2003-2010 to explore the accusation that Bashar al Assad and the Syrian government deliberately supported Al-Qaeda jihadis in Syria so they could carry out attacks in Iraq. As these years were the formative ones for ISIS, then known by a series of different names, the evidence strongly, but not conclusively, points to Syria having helped ISIS form. There is no evidence that Syria intended for the jihadi group to grow into what it has become, but rather that Syria seems to have supported it for short-term, strategic ends. Late last fall, a series was released by the Daily Beast about Bashar Al-Assad and his government’s supposed role in the formation of ISIS. Part One explored how the regime facilitated jihadis in Syria from 2000-2010 by letting them base themselves in Syria. Part Two details how a series of bombings in Damascus in late 2011 and early 2012 when the uprisings in Syria were really gaining steam were actually carried out by the Assad regime and blamed on Al-Qaeda. The defectors interviewed claim this was done to sectarianize the uprising and provide support for Assad’s discourse that he was fighting terror and needed Western support doing this. Part Three explores all the instances on the battlefield in Syria where the regime supposedly avoided clashing with ISIS. The claims in the series, especially those in part one, have been present in pubic discourse for some time and were expressed in a more detailed form with citations by Charles Lister in his “The Syrian Jihad“. Can the claims that come from defectors and anti-regime rebels be corroborated in these other sources? What kinds of sources do these other works use and can they help us triangulate the issues? I won’t go into the backgrounds of each author- Lister and Gutman- readers can do that for themselves and decide for themselves if they think the background/employer is relevant here. From my point of view, news organizations certainly develop or lose credibility over time but a serious critique of the piece can’t stop at reputation, it has to look at the sources. I will go through Lister’s sources and other publicly available sources, to see if they correspond here with what defectors claim, and if this story holds water. Let’s look at the news sources in particular- as I am going through Lister’s sources and following where the trail leads, this will only be roughly chronological, while primarily following the sources. The first source, Ghaith Abdel Ahad in the Washington Post (6/5/04) interviews a Syrian man, Abu Ibrahim, about his work helping fighters move out of Syria into Iraq to fight against US forces. The story here, cited by Lister, a full seven years before the beginning of uprisings in Syria, is almost identical to what the Daily Beast recounts. His own story of radicalization, interestingly, comes from 7 years in Saudi Arabia, exposure to Wahhabism, and finding a welcome community around Abu Qaqaa back in Aleppo upon his return. Qaqaa, in both the Daily Beast and Lister accounts, was the central figure in Aleppo quietly sponsored by the Syrian government. The rest of the piece is very good, but too long to recount here, read it for yourselves. That means most of Adbdelnour’s claims should not be accepted unless they can be corroborated by other sources. To follow the one branch I could from Abdelnour’s citations, I found no.10, “Arab Neighbors Queue for ticket to Martyrdom” (4/1/03), the author of which remained anonymous. It discusses how not only Syrians crossed into Iraq to fight from Syria, but that many other Arabs of various nationalities would first travel to Syria and then cross into Iraq on busses. Egypt attempted to stop its citizens from traveling to Iraq, but “[D]espite the restrictions, bus-loads of people are leaving each night from outside the Iraqi embassy in Damascus bound for Baghdad.” This piece never connects these events to Bashar al-Assad, but neutrally reports their existence independent of any accusations against Assad. After reading it one gets the impression the Syrian government was doing almost nothing to stop the phenomenon. Between these first four sources, we see a broad base of different publications, each sketching out their own version of events that highly overlap with different sources. The trademarks of coordination, especially direct repetition of talking points, are not here. Readers can ultimately judge for themselves. A fifth, which I found in my own digging that isn’t cited by either Lister or Gutman is this cable from Wikileaks (3/20/03). It details how Syria closed its border with Iraq once the war started and set up camps to help refugees. It shows clearly that Syria was conscious of the border issue and at least attempted to close it. If Syria knew about this earlier and the issues continued, it supports the accusations but doesn’t prove them. The idea that an Al-Qaeda operative would have to enroll in a security course in Syria raises the question- if this was happening in Syria, how could Assad’s government not know about it? Almost a year after Muthanna’s death, another raid carried out by US Special Forces in Syria apparently killed an Iraqi Al-Qaeda operative named Abu Ghadiya. Detalied in “Officials Say U.S. Killed an Iraqi in Raid in Syria,” (10/27/08) the raid happened in Sukkariyah. The NYT piece, as that paper is wont to do, cites unnamed intelligence officials in its account, so those claims should be considered dubitable for our purposes here. Around the same time as the two aforementioned events by the Syria/Iraq border, a series of records were discovered in Sinjar, Iraq. A Christian Science Monitor report (1/08) looked at these records and cited a CTC study about them. The CTC study neatly summarized its main findings from the Sinjar Records, and was cited in the Daily Beast piece. Gutman quotes the piece, pointing out how “it is almost inconceivable that Syrian intelligence has not tried to penetrate these networks.” What Gutman didn’t quote, however, seems even stronger to this reader’s mind- that evidence in the Sinjar documents shows that Al-Qaeda fighters commonly had multiple coordinators in Syria (p. 25). The fighters were also asked to rate the trustworthiness these coordinators, which seems to imply that the Iraqis don’t trust those they are working with in Syria (p.25). The question, then, is if this lack of trust comes from them being smugglers that AQ thinks are ultimately putting profits first, or if it is potentially because they were from Syrian intelligence (or someone else?) If it wasn’t the Syrian government behind this in some form, then again, the question hangs in the air: how could the Syrian government not know and/or do nothing to stop it? There is yet more evidence from this period about not only the flow of jihadis from Syria to Iraq but also Syria’s involvement. “Iraq’s Ho Chi Minh Trail” by James Denselow (5/15/08), does not point the finger at Assad but does engage with the issue of the Syria-Iraq border as the primary transit point for foreign fighters entering Iraq. A Reuters report (9/30/09) shows a different angle supporting the claims that Syria was involved. In “Iraq al Qaeda militant says Syria trained him“, a videotape of a man who identifies himself as Mohammad Hassan al-Shemari was at the center of a diplomatic row between Iraq and Syria. A bombing in Baghdad was blamed on Syria by the Iraqi government, and the video of al-Shemari was offered as evidence. Al-Shemari, a Saudi national, claims he was trained by Syria in camps known to Syrian intelligence. The Reuters story points out it was not possible to independently verify al-Shemari’s account, but readers can already see here how it lines up with other accounts. Iraq continued to suffer from bombings that made the country’s leadership clash with Syria in August 2009. In early December of that same year, more bombings took place (four in one day) that killed more than 100 and injured several hundred more. This was detailed in “Baghdad Car Bombs Blamed on Syria and Islamists by Iraqi Government.” What is especially intriguing is that Maliki’s government, by this time falling out with Washington over its increasingly sectarian and authoritarian rule, leveled these accusations. The popular narrative goes that Iran supports both Assad and Maliki, but this fissure shows we can’t reduce geopolitics to clear outcomes on the ground. As mentioned earlier, the Iraqi government released the video of the Al-Qaeda militant and his testimony, but new evidence below supports the allegations. If true, it resonates strongly with the form that ISIS takes years later. It also raises questions about the extent to which this was a continuation of the earlier practice of sponsoring jihadis like Abu Qaqaa or if this resembles that earlier phenomenon in form but is actually something else? So adding to the pile of evidence, Nouri al-Maliki’s government publicly accused Syria of abetting jihadis. This report doesn’t blame the Syrian government exactly, but again it points to events and names individuals involved. I can imagine that some will be hesitant to trust public reports from the US government, but these details are broadly corroborated in a wikileaks document cited by both Lister and the Daily Beast. Let’s look at it next. The document is dated 2/24/10. It details a surprise appearance by Syrian General Intelligence Director Ali Mamluk at a meeting between Syrian Vice Foreign Minister Faisal al-Miqdad and an American delegation led by S/CT Daniel Benjamin. Mamluk agrees that Syria is willing to potentially work with the US on several issues of importance, especially the Syria/Iraq border, if the US is willing to change several policies of interest to the Syrians. Later in the document, Mamluk describes Syria’s approach to terrorist groups, which is to infiltrate them rather than immediately clash with them, something Mamluk insisted had been successful. It is not only quite remarkable that Mamluk would admit this to the American delegation, but he also was willing to negotiate over the Syria/Iraq border, showing that Syria knew it could do more in this regard, and held it out to the US as a diplomatic carrot. As readers should know, the controversy around Wikileaks focuses on what the organization decides to publish, not the veracity of the documents they publish. There is no reason to suspect that either of the documents from Wikileaks I cited in this post are not real, or that any of the documents Wikileaks has put online are not real. Finally, the last wikileaks document (2/24/10) seems to corroborate what the Gutman piece about the Syrian government claimed, that the Syrians penetrated ISIS and have constant tabs on the organization from the inside. This is exactly how Mamluk described Syria’s policy toward jihadis. By digging into a small sample of the publicly available evidence, a number of points become clear. First, Syria features in accounts from different years and completely different media outlets in different parts of the world as the primary country that jihadis travel to before traveling on to Iraq. This is corroborated in multiple accounts spelled out above, as well as in the Sinjar records and the raids that killed Abu Ghadiya and Muthanna. This helps establish the phenomenon as real, whether or not the Syrian state was involved. As Turkey is to the Syrian War today, Syria was to the Iraq War then. Stepping forward from this base, numerous pieces of evidence outlined above support the central claim in both The Syrian Jihad by Charles Lister and in the Daily Beast series that Bashar al-Assad’s government sponsored and facilitated this flow of jihadis. Given the timing, location, and affiliations of these jihadis, it is possible to see this as having a significant impact on salafi-jihadi groups in Iraq right when the first iterations of ISIS were forming. The evidence thus strongly supports the conclusion that Assad had a strong hand in helping the organization grow at a key time in its timeline, rather than fighting them. I agree with Lister’s conclusion that Assad seemingly wanted to control this jihadi threat and direct it away from his regime, rather than stifling it. This also broadly lines up with part of the argument in Jean Pierre Filiu’s “From Deep State to Islamic State” that authoritarian regimes tolerated or facilitated jihadis for a variety of reasons, pointing to Syria and Yemen most primarily. I realize that the evidence here is not conclusive, I don’t claim anything else. I do, however, see it as ruling out most possibilities of doubt. It comes from too many different sources, stretched across a broad swath of time, all of which significantly predates the uprisings in Syria in early 2011. This review has been some time in the making. 393 pages in the making, to be exact. It is by far the longest of the books I have read and reviewed about Daesh so far, but does that length equal quality? Lister’s work is ambitious. In these 393 pages, he only covers a time span of about 4 years. The chapters are divided into periods of time of about 6 months each, and his periodization of the conflict is among the most systematic and detailed of its kind. The subtitle of the book is Al-Qaeda, the Islamic State, and the Evolution of an Insurgency. Lister has become a controversial figure, especially on Twitter. That is to be expected, however, in a conflict as confusing and complicated as the one in Syria. Any position one takes will anger at least two others, for different reasons. As readers can discern from the title, it is not exclusively about the Syrian Civil War. This becomes clear as the reader moves through the book, where attention is paid to the regime and its foreign backers, but much more attention is paid to the various jihadist groups. Having read the book cover to cover, I don’t remember coming across Qassem al-Suleimani once. If the book were about the war more broadly, such an omission would be inexcusable- a leading general from Iran on the ground in Syria would need to be discussed. Thus, Lister’s focus necessitates detailing battles, alliances, and the changing balance of power in the conflict, but with a pronounced emphasis on one side of the war. That makes it come deceptively close to a history of the war itself. Inside of its own boundaries, the book does several things very well. Chapter three, “Syria’s Flirtation With Jihadism” had my jaw on the floor the entire time. Bashar al-Assad’s government here is shown to have not only fostered Al-Qaeda and other jihadists, but that it did so for more than a decade leading up to the outbreak of war in 2011. The chapter not only made multiple pieces fall into place in my mind, but it makes an argument publicly that needs a lot more attention. It is in line with the argument of Jean-Pierre Filiu’s work From Deep State to Islamic State in its focus on intelligence agencies and their role in sponsoring jihadism. The coldest irony out of all of that is that Assad’s Syria was actually guilty of ties to Al-Qaeda that Saddam’s Iraq was accused of. It makes those still defending Assad’s government look even more ridiculous, especially if they repeat his lie that his government is fighting terrorists, especially given that a) it sponsored them for a decade, and b) released all of the jihadists it had in prison at the time of the beginning of the war. Enter Wikileaks, an organization with a mission I otherwise support. They published a book which summarized the revelations of the Wikileaks documents in multiple chapters, each devoted to a separate country. As much as I like Wikileaks challenging the powerful and demanding transparency, I must say the chapter about Syria is so myopic in this regard it fails to take into account any of the scholarship available about Syria. It is entirely based on Wikileaks cables, and blames US empire entirely for the rise of Daesh, even incredulously asking how the US dare accuse Syria of supporting terrorism. If the author of that chapter, Robert Naiman, drew on other works, especially Lister’s, he’d have the clear answer to his question. One of the things that stands out most about this work is the sustained detail about the plethora of non-Daesh groups in Syria. There are about 5 total militias that have name recognition for many people, and for even more Daesh is the only one they could name. The FSA, Jabhat al-Nusra, and Ahrar al-Sham are the most recognizable ones besides Daesh, but there are many more smaller militias which fought or still fight today. Note I am not saying the FSA are jihadists, just that they are usually known to non-specialists. While many lazily say that the uprising in Syria has been jihadist in character from the beginning, Lister’s book lays out the timeline in detail. I remember writing a research paper in the spring of 2012, and there were only rumors at that time that Al-Qaeda was showing up in Syria, with no solid evidence. It was a question that hung in the air, but that was decisively answered later as history unfolded. Chapter 6 details the rise of Jabhat al-Nusra specifically in late 2012 and early 2013. Lister presents a victory at al-Taana Defense base east of Aleppo on the road to Raqqa in October as what he believes was the first major victory in the war by salafist-jihadist forces (87). Readers unfamiliar with the messy details can get a good picture of the complex nature of rebel alliances and coordination. Jabhat al-Nusra, especially, has been presented as the most extreme non-Daesh group with its connection to Al-Qaeda emphasized. The chapter also finds the emergence of Ahrar al-Sham (107). Other rebels, however, have more often than not collaborated with Nusra rather than trying to shun them. This broad statement doesn’t apply to the entire conflict, but Nusra collaborated with both Ahrar al-Sham and the FSA at various points. Nusra collaborated with a number of “secular” militias despite the explicit decrees from Ayman al-Zawahiri, the leader of Al-Qaeda after Bin Laden’s death. The basic story of Nusra appears clearly for readers- something started by the Islamic State in Iraq in 2011 inside of Syria which they never publicly acknowledged until some time later. The name Jabhat al-Nusra, literally “the support front” points to this role. In April 2013, Abu Bakr al-Baghdadi released a recording claiming as much in addition to the fact that ISI had financed Nusra for the first two years (122). Baghdadi announced the cancellation of both the old name “Islamic State in Iraq” as well as “Jabhat al -Nusra” and their unification under one, new name: Islamic State in Iraq and the Levant (122). The problem was that Jolani, and the Nusra front he led did not want to be subsumed under ISIS and instead pledged allegiance to Ayman al-Zawahiri and Al-Qaeda more broadly (123), where ISIS had broken away from AQ some time ago. Thus ISI was previously Al-Qaeda in Iraq, Nusra was initially an extension of ISI, but by mid 2013 they were separate groups with Nusra going back to AQ while ISIS remained on its own. There have also been numbers of rebels who have changed militias as the war continued, and Lister at various points helps point out why others might join militias they don’t necessarily agree with ideologically. Ahrar al-Sham is a group that Lister is particularly well placed to cover, as he uses his personal connections with the leaders to interview and quote them at length throughout the book. Some have used this as a criticism of Lister, that he’s too close to this group in particular to be objective. Readers can decide for themselves. 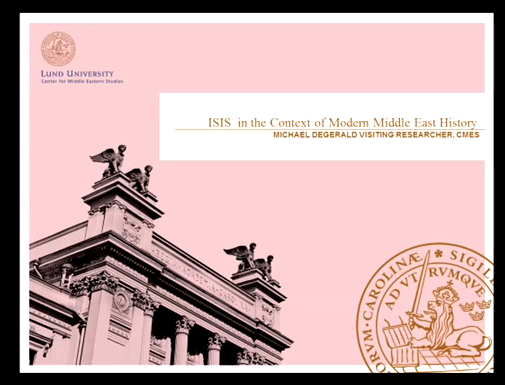 The Syrian Jihad as a History of Daesh? Readers who pick up this book expecting to learn about the Islamic State will likely have mixed feelings. In his layout, Lister covers the emergence of the group in the context of the war in Syria, and chapter 7 is especially good in this regard. Often lost in the discussions that begin with the seizure of Mosul in June 2014 is the complex and violent 18 months (more or less) that led up to that. Violent infighting between jihadists and Daesh, especially in the second half of 2013, culminated in a series of coordinated jihadist offensives against Daesh in early 2014. This infighting especially became more prominent after the split between ISIS and Nusra described above. Daesh had targeted the leaders of other groups, had attacked their positions, and even kidnapped and killed the leader of one militia sent to negotiate with them. In October 2013, The most powerful jihadist factions, including Ahrar al-Sham, Suqur al-Sham, Liwa al-Tawhid, Jaish al-Islam and others signed a joint statement demanding Daesh cease attacking other jihadis, to no avail. Not long after in November 2013 the Islamic Front was formed, a coalition of these and other groups (174). This wave of attacks by the aforementioned groups and the FSA helped push Daesh out of many areas around Aleppo, forcing the group to withdraw to Raqqa, al-Bab, and Manbij. Chapter 11 actually exits from the timeline Lister had followed until that point to follow the history of Daesh back into the late 1990s. His timeline here is largely the traditional one found in other works, starting with Abu Musab al-Zarqawi and his activities in Afghanistan. His analysis brings more detail into the inner workings of the various jihadi groups in Iraq, laying out a coalition formed between Al-Qaeda in Iraq and five other groups, called the Majlis Shura al-Mujahideen. This transitions nicely into the Sahwa, an important topic that doesn’t get enough attention in discussions of Daesh. The Sahwa was a tribal uprising out of the Anbar province in western Iraq which arose to challenge the violent imposition of sharia law by then Islamic State in Iraq (ISI). One can see the importance of the Sahwa now in the fact that it entered Daesh discourse to refer to local resistance against the group, which they stereotype as having been bought by western money. Thankfully absent here are lazy attempts to blame Obama for pulling out of Iraq for the rise of ISIS, or counterfactual claims that Saddam had done enough in the 90’s to bring about Daesh independent of the criminal and catastrophic US invasion. Overall, Lister’s work is far too detailed for me to evaluate in more depth in a blog post. This is good for those looking for a solid source to begin with about the conflict, especially those seeking to grasp the transformations that have taken place over its course. Unfortunately, it is not a very easy read- it gets very formulaic and boring at times. The upside of that rigor is that it helps Lister’s work stand out from other books, but also makes the barrier to entry for non-experts high. I wouldn’t recommend this book unless you’re ready to really go at it with a highlighter and take a ton of notes. It is not airport reading you can breeze through and finish feeling more informed. He only briefly discusses the issue of Shi’a jihadis in the war, noting on page 386 right before he wraps up that upwards of 10,000 Shi’i jihadis had passed through Syria, immediately making one ask why he didn’t cover it more. I guess the title of the book should be “The (Sunni) Syrian Jihad”. That said, Lister makes an interesting and provocative point about Jabhat al-Nusra in the introduction that he picks up again in the final chapter, that it has been more successful in moderating itself (relative to Daesh) and has been successful at building coalitions unlike Daesh, culminating in an arguably more established presence in Syria than Daesh. Only time will tell how this argument holds up. Finally, if my own use of the book is any indication, you’ll see me citing it a lot in my upcoming work about Daesh. Esta é a versão portuguesa de um artigo originalmente publicado em sueco, no jornal Sydsvenskan. O original pode ser consultado aqui, e a tradução inglesa aqui. Gostaria de agradecer a Filipa Pestana pela tradução! Podem encontrar a sua página aqui. A captura de Mossul pelo ISIS, em Junho de 2014, anunciou definitivamente a sua presença ao mundo. As causas profundas da sua emergência são complexas e multifacetadas. A maioria destas causas teve origem ao longo dos últimos 10 anos, especialmente o prolongado vácuo de poder resultante da invasão americana do Iraque. Outros fatores, muito mais antigos, estão associados a fenómenos presentes em várias sociedades do Médio Oriente nos últimos 40 anos, nomeadamente o fracasso do nacionalismo árabe e o crescimento do Islão político. No entanto, nem todas as raízes se encontram no Médio Oriente. O conflito sangrento na Chechénia desempenhou certamente um papel importante. Devemos igualmente reconhecer o racismo institucional e estrutural nas sociedades europeias, que tanto tem dificultado a integração de imigrantes árabes e muçulmanos. Todas estas regiões, ainda que geograficamente díspares, contribuíram para o fluxo de jihadistas que se vêm juntando às fileiras do Estado Islâmico. A geopolítica que anima o conflito com o ISIS tem também raízes muito profundas. Podemos entender a realidade contemporânea como um mundo no crepúsculo da tentativa fracassada dos Estados Unidos de se afirmarem como potência soberana, do ponto de vista das relações internacionais. Como reação errónea aos eventos do 11 de Setembro, os Estados Unidos iniciaram uma “Guerra ao Terror”, e procederam à “de-Baathificação” e à desmontagem do exército iraquiano, após as quais o Iraque sofreu anos de instabilidade prolongada. Muitos dos que trabalhavam para o antigo regime perderam os seus postos. Sem estes fatores, o Iraque não teria assistido ao crescimento do ISIS tal como o conhecemos hoje. Por outro lado, o Irão (maioritariamente Xiita) tem sido bastante ativo a nível regional desde a Revolução Islâmica de 1979, tendo aproveitado a oportunidade de exercer uma maior influência sobre o Iraque após a queda de Saddam Hussein. Muitas das dinâmicas que se seguiram são conhecidas: o Irão apoia o regime de Bashar Al-Assad na Síria, enquanto a Arábia Saudita e as restantes monarquias Sunitas apoiam os grupos rebeldes que procuram depô-lo. Estas monarquias e regimes Sunitas, como a referida Arábia Saudita, mas também o Bahrain, o Qatar, o Kuwait, a Jordânia, ou o Egito, contam com o incondicional apoio americano. Isto representa a aposta americana de longo-prazo nas monarquias Sunitas, uma estratégia controlar o Irão pós-1979 e ao mesmo tempo aliar-se às nações produtoras de petróleo. Outras circunstâncias geopolíticas contribuem ainda para o crescimento do ISIS. O apoio iraniano ao governo de Maliki no Iraque e aos seus excessos sectários, tem levado vários grupos Sunitas a tentar encontrar uma solução. A Turquia tem mostrado interesse em albergar os grupos rebeldes que lutam contra Assad, bem como em permitir o movimento de rebeldes e de material militar através da sua fronteira com a Síria. Embora a Turquia pudesse certamente tomar medidas para exercer maior controlo sobre quem atravessa as suas fronteiras em direção à zona de guerra, sobretudo guerrilheiros que viajam para se juntar ao Estado Islâmico, a verdade é que não consegue controlar completamente uma fronteira tão ampla e geograficamente complexa. A porosidade desta fronteira tem contribuído para inflamar não só a guerra na Síria, por via da mobilidade de jihadistas do ISIS, mas também a capacidade do Estado Islâmico de lucrar com a exportação de petróleo. Numa perspectiva mais alargada, é também de mencionar a natureza do sistema global de mobilidade. Na atualidade, este sistema dirige todos os esforços para facilitar a circulação de bens e de capital, e por oposição, para controlar o movimento de pessoas. Bastará pensar nas recentes Parceria Trans-Pacífica (TPP) e Parceria Trans-Atlântica de Comércio e Investimento (TTIP) para se compreender que os Estados poderosos desejam ver circular livremente bens e capitais, enquanto a crise de refugiados na Europa e na Turquia tem revelado uma pretensão de estancar o movimento de pessoas. Esta tendência, que ganha corpo na expressão “Fortaleza Europa”, consiste essencialmente em impedir certos migrantes de chegar à Europa, permitindo porém que os detentores de passaportes dos EUA/UE se movimentem livremente para fora da zona protegida. É precisamente este sistema que tem permitido que muitos indivíduos já identificados pelos serviços secretos americanos e europeus abandonem estes territórios e viajem para ingressar as fileiras do ISIS. Funcionasse o sistema global de forma diferente, e estes cidadãos ocidentais teriam muito maior dificuldade em fazê-lo. O futuro do jogo permanece complexo e sem soluções claras. Se Assad for derrotado antes do ISIS, existe uma forte possibilidade de este último poder expandir-se para áreas deixadas vazias pelo regime, tal como procura já fazer na cidade de Hama. O colapso do governo de Assad produzirá muito provavelmente um êxodo de população civil residente em áreas controladas pelo regime. Em alternativa, caso o ISIS seja derrotado e Assad permaneça, o legado tóxico da guerra arruinará a sua capacidade de governar o país e a Síria terá muita dificuldade em regressar à normalidade num qualquer curto/médio prazo. Por fim, a hipótese de os grupos rebeldes em conjunto com as forças ocidentais conseguirem derrotar tanto Assad como o ISIS abriria um colossal vazio de poder, tão difícil de estabilizar como no caso do Iraque e da Líbia – um erro que as forças ocidentais não podem dar-se ao luxo de voltar a cometer. A vontade da Rússia de entrar no conflito é menos complexa – efetivamente, arrisca piorar uma guerra já suficientemente complexa, mas também não está a empurrar o regime em direção ao colapso. Está a tentar explicitamente estabilizar o regime criminoso de Assad, não tendo meios para lidar com o legado tóxico com que o povo sírio terá de viver se esse regime sobreviver e estabilizar. This in the English original of an editorial about the geopolitics of ISIS I wrote for a Swedish newspaper, Sydsvenskan. The Swedish piece can be found here. The seizure of Mosul by ISIS in June 2014 truly announced their presence to the world. The root causes of ISIS’ emergence were multifaceted and complex. Many of these causal factors were less than 10 years old, coming out of the prolonged power vacuum created by the failed US invasion of Iraq. Others have much older roots in phenomena present in various Middle Eastern societies over the last 40 years. These include the defeat of Arab Nationalism and the rise of political Islam. Not all of these roots of ISIS stretch back into the Middle East, however. The bloody conflict in Chechnya certainly plays a role, as does the structural and societal racism in various European countries that made it so hard for many immigrants from Arab and Muslim societies to integrate. These geographically disparate regions have all contributed to the flow of jihadis fighting for the Islamic State. The geopolitics prolonging the conflict with ISIS likewise have deep roots. The current reality is best described as a world in the twilight of a failed American attempt at being the world sovereign, at least in terms of international relations. The USA initiated the War on Terror in a flawed response to the events of 9/11. The most proximate cause for ISIS’ emergence comes from the American decision to carry out de-Baathification and disband the Iraqi army. This led to a period of prolonged instability and put many individuals from the former regime out of work, without which we would not have the Islamic State as it exists now. Iran has been very active on a regional level since the 1979 Iranian Revolution, and took the opportunity to become much more influential in Iraq after the US overthrew Saddam. Many of the dynamics that follow are known: Iran supports Assad’s regime while Saudi Arabia and other Sunni monarchies support rebel groups trying to overthrow him. These Sunni monarchies and regimes, like Saudi, Bahrain, Qatar, Kuwait, Jordan, Egypt, etc. have staunch US backing. This represents the USA’s long-term bet on Sunni monarchies as a control against Iranian expansion post 1979, as well as being allies of oil-producing nations. Other geopolitical realities helped ISIS grow. Iran’s support of Maliki’s government in Iraq and its sectarian excesses has been pushing various Sunni groups to find a response. Turkey has proven itself willing to host the rebel groups fighting Bashar al-Assad as well as allowing them to move fighters and materiel through the border between Turkey and Syria. While Turkey could certainly take steps to exert more control over what passes through its borders into the war zone, especially fighters traveling to join the Islamic State, it can’t completely control such a long and geographically complex border. The porosity of this border has fueled not only the war in Syria, the fighters joining ISIS, but also the Islamic State’s ability to export oil for profit. More broadly, the nature of the global system of movement is important. In its present state, the global system does everything it can to allow goods and capital to move freely but to control the movement of people. One need only look at the recent TPP and TTIP to see how powerful countries want goods and capital to move as freely as possible, while the refugee crisis in Europe and Turkey has highlighted just how much many countries want to stem the movements of people. This is embodied in the system known as ‘Fortress Europe’. It focuses on keeping people from reaching Europe, but it is very permissive in allowing anyone with a EU or US passport to move as they please away from the protected core. This has allowed many individuals already known to intelligence agencies in the USA and EU to leave to join the Islamic State. If the global system were not as such, these Western nationals would have a much harder time traveling to fight with ISIS. The potential endgame remains complex and without clear solutions. If Assad is defeated before ISIS, there exists a strong possibility that ISIS will be able to expand into areas vacated by the regime, as they’re trying to do in Hama right now. That collapse of Assad’s government would likely produce an exodus of civilians living in regime-controlled areas. Or, if ISIS is defeated and Assad remains, the toxic legacy of the war will ruin his ability to govern his country or let Syria return to normal in any short to medium term. If the rebel groups combined with Western forces to defeat both Assad and ISIS, it would open a massive power vacuum that would be as difficult to stabilize as Iraq and Libya have already proven to be, a mistake Western forces cannot make again. Russia’s willingness to enter the fight is not as complex- yes they risk making a complex war worse, but they are also not pushing the regime towards collapse. They’re explicitly trying to stabilize the criminal regime of Bashar al-Assad, and have no means of dealing with the toxic legacy the Syrian people will live with if it survives and stabilizes. It should be said at the outset that very little of the book is actually about the Islamic State. Filiu covers some of the very recent developments of the Islamic State in chapter 8, “The Evil Twins in Yemen and Syria”. For those who want to read about the actual members and development of the state-for example the Al-Qaeda networks and details of the chaos in Iraq post-2003- the work by Hassan and Weiss I reviewed here is a much better choice. However, for those with some knowledge of the region, this work is a worthy read that should not be ignored. The author, Jean Pierre Filiu, makes a nuanced and original reading of 20th century Middle Eastern history. This will certainly have its critics and detractors. Filiu then connects this categorization of the Mamluks to the concept of the deep state from contemporary Turkish history. When Filiu says deep state, he is referring to a series of secretive and opaque institutions and actors who guide important policy decisions out of public view. His example from Turkey is a shocking story from 1997 when a car accident in the city of Susurluk exposed a previously secret reality for Turks. A local police chief, a gangster with right-wing nationalist connections, his girlfriend, and an MP aligned with the Kurdish PKK were all in the car together when it crashed, killing the first three I described. These men who were supposed to be on opposite ends of everything ideological were secretly working together. Filiu proceeds to describe the next 18 years of Turkish politics and the rise of the AKP, the party represented by current President, and former Prime Minister, Recep Tayyip Erdoğan. He characterizes the Ergenekon trial and a later trial known as “Sledgehammer” as examples of the AKP using the police and the courts to go after the deep state. He emphasizes that these were very divisive tactics which arguably broke the deep state but had a lot of collateral damage in Turkish politics, especially in polarizing the various parties. Filiu uses the vast majority of the book to set this argument up and trace it through the specific countries he argues to be “neo-Mamluks” which are Egypt, Syria, Algeria and Yemen. Each of these includes a detailed reading of the history to set the reader up to understand how these “Mamluks” came to power in each one. Filiu argues that “(T)here lies a clear distinction between, on the one side, the Arab Mamluks, and, on the other side, police states like Tunisia (under Bourguiba or Ben Ali) or would-be totalitarian regimes like Qaddhafi’s Jamahiriyya or Saddam’s Iraq. Monarchies who had survived the turmoils of the early 70’s (Black September in Jordan and the two failed military coups in Morocco) were also spared the Mamluk curse.” (p. xi). Filiu does not argue that the regimes have secretly colluded along these lines or publicly identified as such, but rather argues we should classify and understand them as the Mamluk regimes. Once Filiu has developed this idea, he turns to the most recent events from the American invasion of Iraq and the Arab Spring until the present. He looks at Egypt and Yemen in chapter 7, “The tale of Two Squares” which refers to Tahrir Square where the first mobilizations of January 25 took place in Cairo, and Rabiya al ‘Adwiya, where a large group of Muslim Brotherhood supporters gathered post-June 30 Coup and some 1,000 plus were massacred by the Egyptian state. It is here we find the most explicit new formulations of argument and ultimately the connection to the Islamic State. Filiu argues that these Mamluk regimes all played with Jihadi fire in their counterrevolutionary actions to deal with the Arab Spring (some before as well) and in doing so, fed the beast that grew into the Islamic State. All of these regimes, in their own unique ways, saw these groups emergent and quietly supported or tolerated them because they met various needs- most centrally the justification of security rents that Filiu focuses on in Yemen and Egypt. When Filiu refers to security rents, he means money supplied to the government from outside donors to preserve security there. I’ve read this idea of a state nurturing a jihadi presence to justify security rents from the West before in The Warrior State, an interesting book about Pakistan. To this reviewer’s mind, his answer to how Tunisia came out so differently from Egypt (an already fraught topic) gets some parts right and others wrong. Filiu is correct to point to the use of the justice system in Tunisia to deal with post-revolutionary terror as a more effective means than the brute state violence used by the Mamluk regime in Egypt. For Filiu, Tunisia represents a successful path out of the problems. Despite (or because of?) Tunisia’s transition and new constitution, it has been one of the largest sources of jihadis going to join the Islamic State. He emphasizes the power of the established trade unions in Tunisia as something that helped the revolution succeed, but I was left scratching my head because Egypt indeed has a complex and strong tradition of trade unions. It has been studied in depth by Beinin and Goldberg among others, so readers can go to them and judge whether Filiu is wrong to write off Egyptian trade unions as he does. Another headscratcher for me came when Filiu seems to argue to let NATO off the hook for the chaos in Libya by instead arguing the problems there came from the failed implementation of plebiscites and compares these to more successful ones in Tunisia. Ultimately, I see Filiu’s argument here to be less than stellar. He describes in the beginning of the book how he invests heavily in a new conception of the “Mamluk” regime, spends the better part of 200 pages developing it, and then argues it to be the strongest causal factor leading to the rise of the Islamic State. This reviewer indeed agrees that authoritarian regimes and their willingness to tolerate and even foster jihadi groups is indeed real, and it is indeed part of what brought about the Islamic State. Is it, however, the largest factor? Does it justify the book-length development of the argument? This reviewer finds it highly questionable at best. I would have preferred to see more here about the prosecution of the war on terror, especially by the USA, and how this has certainly exacerbated the problem of global terrorism rather than smothering it. Filiu should get credit here for addressing this in regard to the Mamluk regimes, but he does not address it more broadly. I would likewise emphasize to a much stronger degree how the outbreak of the Syrian uprising that turns into a civil war ripped open whatever fragile gains had been made in Iraq after the combination of the Sahwa and the US surge. What of the roles of Pakistan and Saudi Arabia? They are not present. Finally, given that we now know that many ex-Ba’thists are involved in the Islamic State, these dynamics of the failed invasion of Iraq and the changes in Saddam’s regime post-1991 need a more thorough examination here. If I had to rank the factors in strength, I would put the failed invasion of Iraq and the consequent issues there above the consistent support of jihadis by authoritarian regimes in the region, regardless of whether the categorization of “neo-Mamluk” can hold water. I see no real opening for ISIS to control territory or create chaos on the level they have absent the power vacuum created by the wrong-headed overthrow of Saddam Hussein. It is indeed counterfactual, for we can’t know how Iraq would have changed or how its own people and regime would have reacted to the Arab Spring playing itself out there. Given the events of 1991 in Iraq, it is not unreasonable to assume that Saddam would have responded with brute force as he did before. What that would have become is something we can only imagine. Finally, in praise of Filiu, his use of the ‘deep state’ concept that he takes from Turkey in the 1990s is quite stimulating. This places the AKP in a unique position as the one example here that succeeded in breaking the deep state, and begs the question, on a new level, of whether or not we can then think of Turkey as some kind of model for other states in the region, or at least the other Mamluks as Filiu classifies them. This would clearly be different than the way many have talked about Turkey as a model for a so-called “Muslim Democracy.” One cannot help but notice that Turkey’s reaction to the Gezi Protests and the way it has carried itself until today bears striking resemblance to the patterns Filiu outlines in Yemen and Syria where the regimes deliberately provoked wars with the jihadis and presented themselves as the saviors to protect people from terror, much as Erdoğan’s AKP now does with regard to the PKK. Clearly, the PKK is not the same as Al-Qaeda. Neither is the democracy in Turkey, however weak, comparable to the regimes in Yemen and Syria. It does, however, then beg the question of what this will lead to in Turkey and whether or not Filiu should be thinking of the AKP as similar to the Mamluks. Should Filiu then be willing to say authoritarianism is a part of the the condition to be a Mamluk, if supposedly democratic Turkey is acting in a similar manner to the Mamluks? That Erdogan is also willing to start a war with the PKK to stay in power? History will have to play itself out before that question can be answered. Let me reiterate again that whatever criticisms I have here are my attempt to hold a strong historian accountable for his arguments and to evaluate them in a reasoned, scholarly manner. The book is worth reading for anyone ready to get into the deeper dynamics of 20th century history that led to the emergence of the Islamic State. Before reading this book, several things raised my expectations. Foremost among them was Cockburn’s book, Muqtada Al-Sadr and the Battle for the Future of Iraq. Cockburn’s book about the enigmatic and important Muqtada Al-Sadr showed exactly what he was capable of- a gripping journalistic account that mixed his willingness to go to risky places (Iraq post-American Invasion) to get the info he needed along with his skills as a writer. I left that book wanting to read more and I remember being disappointed that my copy was all but destroyed after being lent to some friends. Second, Cockburn regularly writes for The Independent, and his columns are consistently solid. Knowing that he wasn’t just another writer jumping on the opportunity to write about ISIS without the actual background needed to do so, I expected a lot. After reading Cockburn’s latest, my expectations were not entirely met. Cockburn’s work here seems solid in the beginning but as I advanced through the book, I started to wonder where he was going next and why. The structure of the book, if we can say it has one, leaves a lot to be desired. The only thing that makes up for this is Cockburn’s otherwise sharp analysis and clearly deep knowledge of the subject at hand. Cockburn opens and makes a clearer thesis statement, finding the origins of ISIS in the War on Terror as a response to 9/11. “ISIS is the child of war” he states (p.8). He bluntly argues that the USA limited the potential effectiveness of the War on Terror from the beginning by refusing to seriously confront Pakistan or Saudi Arabia for their roles in stimulating and supporting Islamic extremism. Chapter one follows this theme, broadly exploring the role of Saudi Arabia in stimulating extremism both in sermons and violent groups. Saudi Arabia propagates Wahhabism (5) and puts up money for the building of mosques and the training of imams (6). In response to the Arab Uprisings of 2011, known to many as the Arab Spring, Cockburn argues that it “was the jihadi and Sunni-sectarian militarized wing of rebel movements that received massive injections of money from the kings and emirs of the Gulf” (8). In Chapter 2, Cockburn lays his argument that the fall of Mosul to ISIS in June 2014 was a turning point in the history of Iraq Syria and the Middle East (13). He elaborates on the widely reported stories of the disintegration of the Iraqi Army, but emphasizes that there was a popular element that has been overlooked (16). He explains how residents of Mosul mobilized independently of ISIS to push Iraqi forces (Shi’a) out of Mosul whom they perceived to be Iranian proxies. Whether or not these troops were actually more loyal to Iran than they were to Iraq, it must be noted here (and Cockburn doesn’t) that this is one of Saddam’s lasting legacies. After the 1991 Intifada, Saddam’s government labeled the Iraqi Shiites who had dared to try to overthrow his government by force as Iranian interlopers, itself a discourse his government had propagated throughout the eight-year long war with Iran. Cockburn attacks the idea that the surge by US troops in 2007 had actually wiped out the jihadist threat. He cites multiple examples from Mosul about how Al-Qaeda in Iraq (the predecessor of ISIS) ran protection rackets in Mosul, with local businesses having to pay monthly bribes for security even after the supposed success of the surge(12). He quotes a Turkish businessman who claims he went to the central government in Baghdad to complain about these problems. Al-Qaeda was supposedly demanding $500,000 per month from his business but Baghdad told him to just factor it into his cost of doing business, apparently unwilling or unable to address the issue. Chapter 3 continues this account, focusing on the weakness of the Iraqi government. Cockburn arrived in Baghdad not long after this fall of Mosul, and perceived a state of denial among both citizens and government figures. Chapter 4 rambles too much for my liking. It has some useful info here and there, but it significantly overlaps with other chapters and even ends up enforcing the thesis put forward in chapter one. Given that thesis in central to the book, it should be clear, but the wandering structure here does it no favors. That said, there is useful info in chapter 4. Chapter 5 returns to issues already explored in previous chapters, and the reader isn’t clear why these things are getting mentioned now and not earlier. It supports the feeling one gets that a series of already written pieces were strung together for this book. Chapter 6 is a nod to various writers, especially foreign leftists, who insisted that the uprisings in Syria began in a predominantly peaceful and secular way, only to be taken over as the violence intensified and war began to swallow all in its reach. This is put forth in contrast to some who argue the uprisings were a Western plot to overthrow Assad, never involved Syrians real Syrians, and that all Syrians supported the Assad regime against its Western challengers. Cockburn emphasizes that those rising up against Assad in the beginning were from lower classes, especially in rural areas where drought and government neglect had led to years of hard times (83-84). Cockburn balances this with his description of how the Syrian FSA was heavily funded and supported by various Arab governments like Qatar, Saudi, and others. Chapter 7 returns to the arguments about Saudi elaborated in chapter 1 (p 100-105). He does add new substance to the arguments here, discussing broader Saudi foreign policy, how the Kingdom has handled its own citizens becoming jihadis, and whether or not the Saudi government is genuine in its attempts to leave its divisive and sectarian ways behind (Cockburn is doubtful). Chapter 8, “If it bleeds, it leads” is an interesting segue into a discussion about the complexities of media coverage of war. Cockburn’s chapter is stimulating at multiple points and the reader, even one already familiar with these ideas, leaves with an interesting critical angle to the coverage of the Syrian Civil War and ISIS. It doesn’t add any new information about ISIS specifically. Chapter 9 returns to the fall of Mosul in June 2014, adding to what Cockburn previously argued about that topic in chapter 3. Cockburn really wants to emphasize that the collapse of the Iraqi Army should have been foreseen, and that the spreading instability is largely a result of spillover from the Syrian Civil War destabilizing Iraq (137). Cockburn closes with an afterword about Kobane, the Syrian Kurdish town where PYG forces and ISIS battled fiercely. As of Cockburn’s writing, the battle hadn’t ended so Cockburn points fingers at Turkey and the USA for failing to come to the aid of the Kurds. Cockburn speculates that if Turkey does get involved, Iran would foment violent irredentism among Kurds inside Turkey. Cockburn points to the history of the mid 70s and 80s when Saddam invaded Kuwait and Iran reignited a Kurdish uprising in northern Iraq that Iraq thought it had solved in 1975 (158-159). What has transpired since the book was published is that despite heavy losses, the Kurds chased ISIS out of Kobane with the help of many coalition airstrikes. The chance of Turkey invading Syria remains palpable, with rumors of its impending implementation swirling from late June 2015 until now, late July 2015. ISIS seems to have ‘successfully’ started just this kind of violent irredentism in Turkey after it carried out a suicide bombing in Suruç, which had led to Kurdish reprisal attacks against Turkish police and escalating protests by Kurds in southeast Turkey as well as Istanbul. Where this will lead, no one can be sure. Overall, if I complain and criticize Cockburn’s book it’s because I hold him to very high standards. His regular columns remain influential and enlightening and should be read by anyone interested in the topics explored in his book. Readers new to the topics will definitely learn a lot and be glad they picked up this book- it is easy to read, makes solid points, and has a coherent argument. It is certainly better than Sekulow’s book I already reviewed, and is a better intro than Hassan and Weiss‘ book, though more advanced readers will prefer Weiss and Hassan’s work to Cockburn’s for its better structure, coherence, and details.